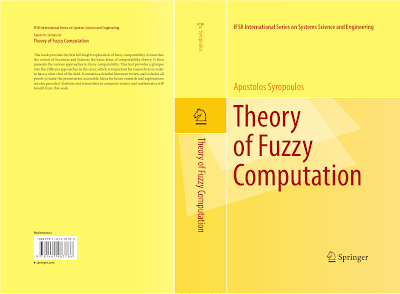 I am really happy to announce the publication of my book on the theory of fuzzy computation. The book is available as an eBook and as a hardback. Readers can freely read the preface and the book's table of contents. A quantum computer for everyone! People who would like to run programs for quantum computers have now the chance to use a real conventional quantum computer! Just point your browser to the Qcloud! This is a service offered by the School of Physics of the University of Bristol, UK. OK this is a joke but I wonder whether it would really make any sense to think seriously about such a thing? There is nothing wrong with particles that travel faster than the light! Judit Madarász and Gergely Székely, in a paper that was recently posted to the arXiv and which is entitled The Existence of Superluminal Particles is Consistent with Relativistic Dynamics, examine whether particles that are supposed to travel faster than the light violate any physical law. Their conclusion is that the existence of particles that travel faster than the light cannot be ruled out by special relativity. Selim Akl has convincingly argued that there is no universal computer. This may come to a surprise to people since one of the first things we learn when studying computability theory is the notion of the universal Turing machine. But then again, we learn that there is a thesis that dictates what and what cannot be computed!